There’s is nothing like a Chicago Bears romping in Nashville to start your week off right. I swear when the Bears play well I begin the week in a better mood. Plain and simple, the Titans got their “asks” kicked (please watch this adorable youtube video to understand the reference). The Bears have now won six consecutive games in a row; this hasn’t happened since 2006, and may actually be considered a contender heading into the difficult part of their schedule (Texans and 49ers woowee). If you missed the Bears Titan mauling, below you will find a quick recap. Who Needs an offense when you have the Bears defense? 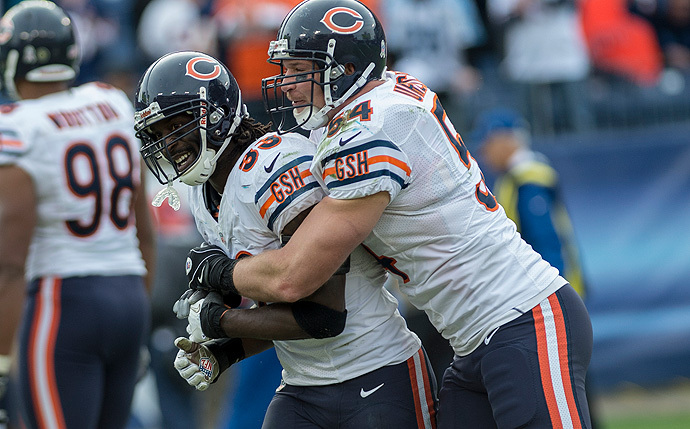 Cornerback Charles Tillman’s ball-punching hands forced a career-high four fumbles. Peanut has been a recognized player in the league for many years, but this year something set the man on fire. He’s absolutely in the running for Defensive Player of the Year. The infamous linebacker Brian Urlacher trotted (it wasn’t as speedy as Tillman or Jennings sprinting down the field, but hey he still got there) his way into the end zone after the team’s seventh interception return touchdown of the season. 7 defensive touchdowns is more than most teams score all season, let alone in 8 games – animals I tell you. If all the critical pieces to the Bears defensive puzzle can stay healthy, this may be the year Bears fans have been waiting for. They couldn’t let the defense have all the fun! It all started when Sherrick McManis blocked a punt (I mean when does that even happen?!) that Corey Wootton returned for a 5 yard touchdown. THEN Devin Hester got in on the action with a 44-yard punt return that set up a one-play scoring drive. Yup – love it. Counting on your defense to score first isn’t going to cut it further down the road for the Bears, but Jay Cutler and his boys woke up in the second half. Cutty eventually threw three touchdown passes to Brandon Marshall. Matt Forte deserves some recognition as well, his rugby style rushing touchdown was the first positive offensive play the Bears had during the game. Forte was also effective in the passing game, his 47 yard reception off of a screen pass was something to be reckoned with. I don’t know what you heard, but LP Field sure sounded like a Bears home game with all that hootin-n-hollerin going on. I can’t imagine it hurts a team’s morale to know their fans are willing to pack their bags and head anywhere to cheer on their monsters of the midway.